When people bring up NICARAGUA in conversation, the first things that comes to mind are war and weapons. Sadly enough, the civil war there did take its toll on the country and, to this day, it struggles to come to terms with its losses and to move toward bettering its situation. In articles on Nicaragua, travel trade publications mostly mention the attractive Pacific Coast, with its tourists and beach front hotels, and the all inclusive resorts. Because I am a Nica (a person from Nicaragua), I am somewhat proud of this Pacific coast, but there is never any mention of what we Nicas call the Atlantic Coast. 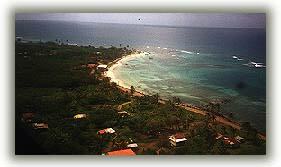 The Atlantic Coast is the largest region in Nicaragua and covers more than 50 percent of the national territory. There is Eco-Tourism galore! Very few people live in this vast area of sandy white beaches and lowland jungle where rivers are the main form of transportation. Most of the inhabitants there are groups of Miskitos Indians, Sumus and Ramas (whose origins are part Indian and part African). This area, known as La Mosquitia region, was not colonized by the Spanish, but, at the request of its inhabitants, was protected against the Spanish by the British. Because of its status as a British protectorate and the colonial contacts with the British Caribbean islands, many people speak a mixture of English and their own native languages. This region is very topographical similar to La Mosquitia coast of Honduras, but the similarities end there. Nicaragua's La Mosquitia has much more infrastructure than the Honduran La Mosquitia. It now has good communications facilities after many years of going without when the previous government was in power. There is e-mail in the Governor's Bluefields city office on the Caribbean, and there are fax facilities, fiber optic telephone lines and electricity in most of the populated regions. This part of Nicaragua is a fascinating challenge for the adventurous traveler. On this particular trip, we covered the Caribbean side of the country, the part mostly unknown, the untouched and mostly virgin country side. We continued to the northern portion by boat. This coast line is called the Atlantic Coast. The seldom spoken part of the largest Central American country. The country is crossed by a rugged road that starts in Matagalpa continues north, crossing rivers Tuma and Prinzapolka, and leading to a town called Siuna and then La Rocita, eventually going all the way to Puerto Cabezas on the Caribbean. A very long and sometimes inaccessible road during the wet season. An alternative to this if traveling by land is a better maintained road that goes from Managua to Rama in the south, boarding the great lake of Nicaragua through quaint towns like Masaya, Granada, Juigalpa, Lovago and then crossing the river Mico three times before arriving in Rama. The rest of the journey to the town of Bluefields is via the majestic Escondido River by boat. Depending on what type of vessel you happen t o get on, it is a lovely trip and which should make for a great adventure in it self. If you have limited time, then use the scheduled airline service available daily, as we did. Our excursion began in Miami, Florida and was jointly arranged by the Ministry of Tourism and the private sector. We will attempt to highlight and link all parties involved in planning our trip so that you will be able to access them directly, ask your own questions, and chart your own excursions and adventure. NICA Airlines, Nicaragua's national airline, welcomed us aboard their 737-200. 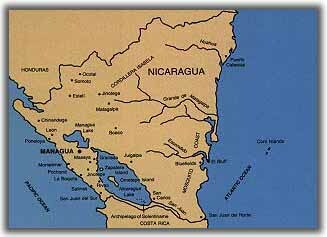 NICA has daily flights out of Miami International Airport to Nicaragua. After a short, 2 -1/2 hour flight, we arrived in Managua and were met by the Ministry. 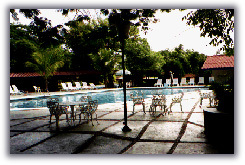 We were taken to Nicaragua's largest hotel, Las Mercedes, a spacious, one-story hotel with 300 rooms, completely surrounded by beautiful gardens. Because it is located across the street from the airport, the hotel is ideal for passengers continuing to the Atlantic Coast as the flights to these destinations are very early in the morning. We were at the ticket counter, which is within walking distance of th e hotel, at 5 a.m., ready to board our NICA flight. We were boarded on a Spanish built CASSA-212 Turboprop which comfortably seats up to 26 passengers in Cabin Class comfort. We departed Managua at 6:35 am. After slightly over an hour we arrived in BLUEFIELDS. This is a great opportunity to look down at th e passing countryside, (Juigalpa, River Mico, Rama then finally Bluefields) through the aircraft's porthole windows. Sit back and order a beverage and catch up with the national newspaper that is offered onboard. Copyright 1996.LatinWorld Magazine Content Is Produced By Netpoint Communications, producers of the LatinWorld Directory. All original articles and photographs published in LatinWorld Magazine are protected by international copyright law. Reproduction, in whole or in part without prior written permission, is strictly prohibited.